We have developed a new conceptual approach for isolating and removing the effects of inhomogeneous liquid water clouds that are potentially a limiting error source for ATOMMS. Previous approaches such as Kursinski et al. (2004a) have assumed that liquid water is distributed spherically symmetrically, clearly a poor approximation given the clumpy and inhomogeneous distribution of clouds. 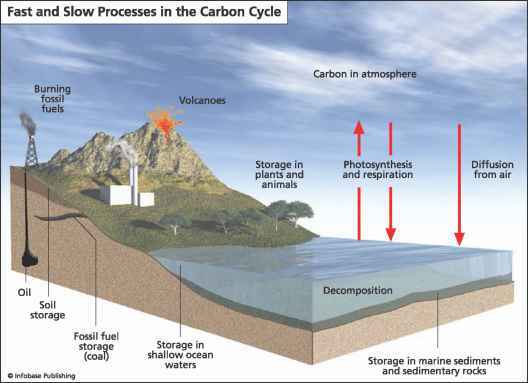 Our approach is conceptually analogous to the method of isolating and removing ice clouds described in Kursinski et al. (2002). Ice clouds cause scattering but no absorption and the scattering dependence on frequency is weak. Therefore the extinction effect is reduced substantially by ratioing the signal amplitudes at similar frequencies, largely eliminating the effect of ice clouds prior to the unraveling of the onion skin via the Abel transform or equivalent retrieval process. A strength of this elimination approach is its lack of sensitivity to the horizontal distribution of the ice clouds. Our desire has been to develop a similar approach for isolating and removing the effects of liquid water clouds. 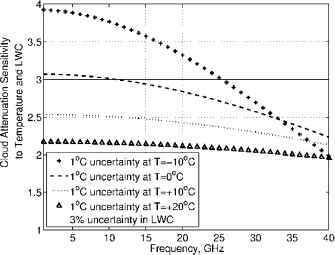 Frequencies near 183 GHz will not be used to measure absorption when liquid water clouds are present because the absorption of liquid water is too large at these frequencies. At low band frequencies (near 22 GHz), scattering can be neglected and the problem is one of separating cloud liquid water absorption from that due to water vapor and dry air. The liquid water absorption spectrum is more complex than that due to scattering by ice both in terms of spectral shape and its dependence on temperature. Because cloud droplet sizes fall in the Rayleigh regime with respect to the low band wavelengths, absorption due to liquid water will depend primarily on liquid water path rather than droplet size distribution. Because the spatial distribution of clouds can be very inhomogeneous, the frequency dependent cloud absorption signature must be isolated and removed from the slant-path absorption measurements before passing them through the Abel transform or equivalent. Not doing so may result in the inhomogeneous distribution of clouds producing some rather poor water vapor retrieval results. shows the fractional changes, in percentage, expected in the cloud absorption spectrum resulting from changes in cloud temperature and in cloud liquid water content (LWC). The dissimilar changes in spectra clearly indicate that changes due to cloud temperature cannot be accurately represented by changes in LWC, particularly at colder temperatures. Thus, if our retrieval algorithm detects the presence of clouds along an occultation path, an estimate is made for two "fitting" parameters: cloud liquid water path and effective cloud temperature. Importantly, no presumption of spherical symmetry is invoked for clouds. The estimate for cloud absorption is removed from each occultation path before making the final species retrievals for temperature and water vapor, which assume local spherical symmetry. Preliminary simulations have shown that we can separate cloud absorption optical depth from the optical depths due to water vapor and dry air based on differences in their absorption as a function of frequency. The presence of clouds generally results in somewhat larger errors in the retrievals of water vapor and temperature. Based on our latest simulations, we expect to retrieve water vapor, temperature, and pressure in cloudy conditions with accuracies within a factor of two of water vapor retrievals in clear air, consistent with the prediction of Kursinski et al. (2002). Two examples showing the effects of clouds on the retrievals of temperature and water vapor are shown in Figs. 7 and 8. In general, the errors in the retrievals of temperature and water vapor increase from the altitude of the cloud downward. This is expected because occultation observations corresponding to lower tangent altitudes can still pass through clouds located at higher altitudes. The ability to estimate two additional parameters, cloud liquid water path and effective cloud temperature, along each occultation path, requires sampling the spectrum with a sufficient number of frequencies to separate the liquid water, water vapor, and dry air spectra using the slant optical depths. Beside the refractivity information derived from the phase measurements and the hydrostatic constraint, we require absorption information from at least four frequencies to isolate liquid water clouds from water vapor and unwanted variations from the instrument and turbulence. If our error estimates prove representative as we expect, then the accuracy (as opposed to precision) of ATOMMS will be limited ultimately by the knowledge of spectroscopy. To quantify and reduce spectroscopic uncertainty, we believe it is crucial that ATOMMS observes at least one additional frequency, bringing the minimum number to five. For this reason, the aircraft version of ATOMMS has 8 frequencies near 22 GHz and we now refer to the technique as an "Active Spectrometer". In general, it is very important that ATOMMS probes with a number of tones that provide sufficient information to ensure that ATOMMS observations do not yield an underdetermined retrieval problem (at least under the local spherical symmetry constraint). 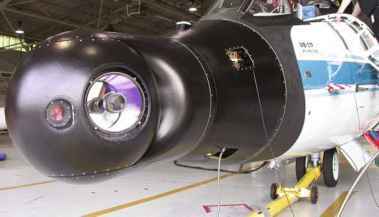 In spring 2009, we will begin to demonstrate the ATOMMS occultation concept using two high-altitude NASA WB-57F aircraft as substitutes for the eventual orbiting platforms. Development of the ATOMMS aircraft instrument and the analysis of the measurements are funded by NSF. NASA is providing the aircraft time. The two aircraft will fly toward one another at approximately 19 km altitude, thus creating a rising occultation that will profile the atmosphere from 0 km to 19 km altitude. This range is sufficient to demonstrate most of the key features of ATOMMS including accurate retrievals in the presence of ice and liquid water clouds and characterization of the impact of turbulence. The low transmit power of the ATOMMS instrument requires high gain antennas and precise pointing. The two WB-57F aircraft that we will use for the demonstration have been fitted with precise pointing noses (see Fig. 9) for imaging material falling from the Space Shuttle at launch. The shuttle imaging system in the noses will be replaced by our ATOMMS instrumentation. Validation, a key part of the demonstration, is challenging because ATOMMS is a state of the art remote sensing system with the ability to penetrate clouds and extremely high vertical resolution but somewhat coarse horizontal resolution. At least one of the aircraft-to-aircraft occultation demonstrations is planned over the Atmospheric Radiation Measurement Program (ARM) site in Oklahoma to utilize the instrumentation there. To the extent possible, the plane of the occultation will be aligned with the prevailing wind direction so that the ground profile observations provide information about the vertical and horizontal structure in the same plane as the occultation measurements. A key aspect of the assessment of the retrievals will be cross comparison of the 22 GHz and 183 GHz water vapor retrievals within a 2 km altitude interval in the troposphere where both sets of profiles will be very accurate. We also note that the possibility of including ACCURATE (Kirchengast et al. 2008) in these aircraft to aircraft demonstrations was discussed at OPAC-3. We hope that an aircraft-compatible version of the near-IR portion of ACCURATE can be developed and proceed sufficiently quickly in Europe that at least one of the ATOMMS aircraft to aircraft occultation demonstrations can include the near-IR portion of ACCURATE to demonstrate and assess its capabilities as well. Acknowledgements This work was supported by NSF ATM grants, 0139511, 0551448, 0723239, and 0739506.